Next aboard was Kelsey, to inspect her work and over whose shoulder was Robert Lacovara, the head Composites instructor at IYRS who, after a few minutes inspection pronounced the work as A+. As the gathering dispersed, I was chatting with Jon about a few things and remarked on the boat’s name. I could not figure out the connection. 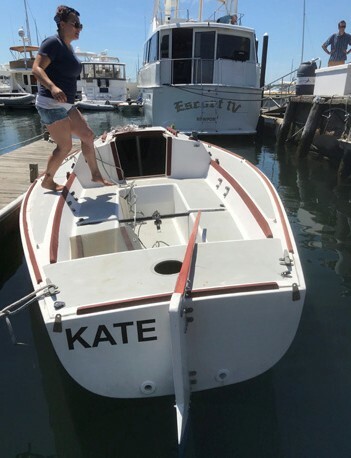 “How appropriate,” I thought, when he said he’d named the boat Kate in honor of Kate Wilson.